On Saturday May 16, 2015, 20 volunteers with the Friends of the Milford Upper Charles Trail conducted the annual trail census. The trail census is one of the ways used to understand the many ways the trail is used on a typical day. 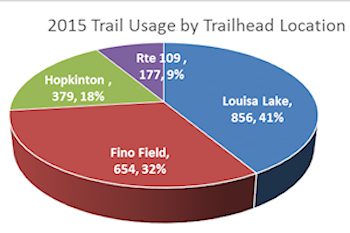 The census is done with volunteers strategically stationed at several trail heads: Louisa Lake, Fino Field Hopkinton and at the Rte. 109 trail crossing. The census began at 8am and went until 6pm. "The 1998 Feasibility study done by MAPC predicted 2,500 users on a weekend day for the fully-built trail. This is only a 6.7 mile section of the then planned 26 mile trail. This far exceeds the expected usage. Well done Milford." The trail census helps to determine trail usage, which is important for installation of cross walks, crossing lights, and signage along the trail. Below are the 2015 Trail Census results showing total number of people per location and respective percentages by location, type of use and time of day. This information is used to understand how and when the trail is used along with providing an overview of the busiest times. The Friends use this data in all of our planning efforts from maintenance discussions with the Parks Dept to safety and education aspects. Other Upper Charles trail towns are also interested in this data as they plan and build their sections of the trail. Prior trail census results can be found in our archives.